World's first penny auction theme for WordPress. The theme also comes with a powerful backend, integrating perfectly with the wordpress admin. It allows you to define bidding packages for your customers to buy. It allows you to set individual increase auction bid and time, each time one of your customers bid, also a starting price for your auction. For more information about the full features of the Penny Auction Theme see the list below. We also have screenshots of the front-end and back-end, plus a live demo of the theme. 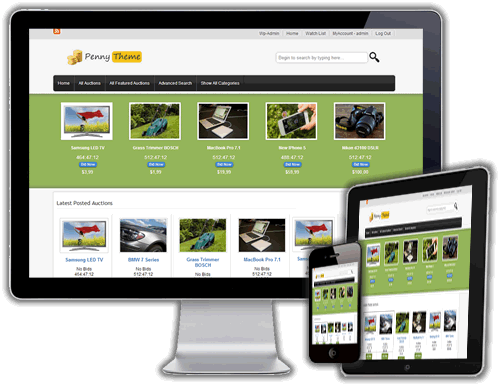 Penny auctions are custom post types and is very easy to add new auctions from wordpress admin, assign categories, assign tags, set start price, set increase bid price and time. We offer you unlimited access to future updates, and lifetime support for all the questions and trouble you might have with installing and using the theme. Our forums are packed with questions and answers about the theme. The theme supports multiple common auction tools, like a start price, bid time increase and many more. Bidding the auctions is easy for your users, they just have to signup an account on your site. Each user has its own account profile with all their bids to the auctions, buy bidding credits packages and more. The Auction Theme supports the latest version of wordpress. The theme has been tested in wordpress 5.0.3 and works flawlessly and each time we keep the theme up to date with the latest wordpress versions. Your users get email notifications, when they bid, they get outbid, or when they receive private messages .